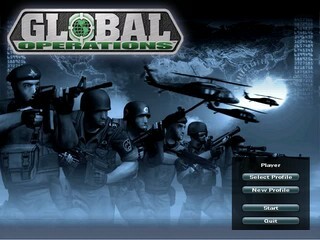 Released in March 2002, Global Operations was one of the many games that mimicked the successful series of Counter-Strike. Like CS you could choose to be either terrorists or counter-terrorists. Unlike most games however it focused on firearms. Lots and lots of them. And then you could customize them so you have even more different types of firearms. Clearly guns are the answer. Note: Some levels of this game are on a fixed timer and thus can't be improved. They are still listed in the table for completeness. Global Operations is an old FPS game which might be best comparable to Counter-Strike. It has a single-player campaign mode with 13 maps. On campaign 1 you play them as counter-terrorist, on campaign 2 you play the same maps in a different order on the terrorist's side. You have several specialties you can decide between. On some maps it's a good idea to choose the sniper or recon, which are the fastest guys but with weak armor and weapons, on others it's better to decide for the slower commando who has effective weapons or the heavy gunner, who is even slower than the commando but has very strong weapons with huge ammo boxes and a better armor protection, just like the commando. There aren't many tricks in this game. There are two methods to speed up bomb maps. If you have to plant the bomb, do it, wait until an enemy is about to defuse it, kill him, take his defuse kit and let the bomb detonate by choosing the wrong wire. If you're on the opposite side, let the enemy plant the bomb and defuse it. Sometimes you have to hold your team-mates back or even kill them to give the enemies enough time plant the bomb. In Sri Lanka I didn't use that trick (taking the enemy's defuse kit) as CT because I didn't knew it at the time I ran this level and I wasn't able to beat that time since then. In Chechnya (as CT) I'm sliding up a rock which allows me to get to the VIP without destroying the AA guns first. That saves a lot of time and might be the only real exploit in this game. On hostage maps (as CT) you don't have to rescue all the hostages. In Peru you have to rescue three of them and in Uganda only one. Kill the others. Sometimes I'm killing myself to either refill health, get new weapons, change the specialty and/or restart at a new place. But of course I'm doing this only where it saves time. Argentina as CT and Peru, South China Sea, Chechnya, Uganda and Colombia as terrorist are not runnable.